In addition, we are also more than eager to work with customers that have their own product. Clothes are certainly not the only items that can be enhanced by our needles and threads. 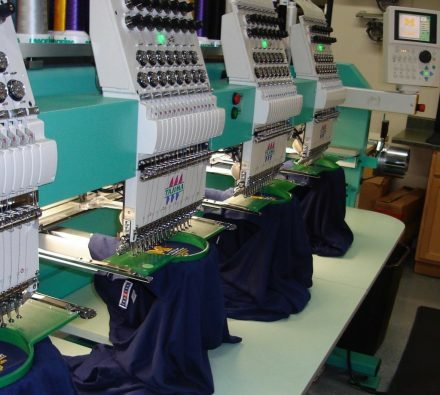 We are one of the precious few custom embroidery businesses in the Ann Arbor area that is willing to work with products that are brought in by the client. Shop by the category that works best for you! We have so many options, but want to keep it simple for you. Narrow your search by looking up products in categories you are looking for. Not every item of clothing or product can be screen printed. Nor can every item be embroidered. At Sunrise Screen Printing, we know which approach is going to give the best result for each product. We take into account its size, shape, material, and curvatures. For instance, a logo that can be put on a jacket cannot necessarily be put on a hat. When you come to Sunrise Screen Printing, chances are you will be looking at the staff that will be doing the hands-on work. Over 90 percent of our custom embroidery will be done by us directly in our shop. The fact that we outsource very little of our work goes a long way in ensuring a timely delivery. As a company that prides ourselves on service, we understand the importance of deadlines. You will find there are only a few businesses around the area that are like us. Most screen printing companies are only able to print items. Likewise, most businesses that do custom embroidery are only able to do just that. Sunrise Screen Printing can bring you the best of both crafts. While our embroidery work may not be the cheapest in the Ann Arbor area, our experience and attention to detail guarantees that you are paying for the best work. Our staff designs for your specific item better than any company around town. The biggest factor in the price of an embroidered product is the size of the design. We can advise you on how to best proceed with your budget. One of the most impressive qualities about embroidery is its durability. In fact, often the fabric of the clothing will start to deteriorate before the logo. You can either come in with your own design, or let us help you create it. Sunrise Screen Printing performs our custom embroidery to all individuals and entities who come to our door. Perhaps your company is doing a promotion. Or you are designing jackets for all the members of your social club, or sports team. Our staff will make your vision come true. From the largest order to the smallest, Sunrise Screen Printing will give you that equal personal attention along with a superior product enhanced with your logo. We have proudly served the Ann Arbor area for over three decades.